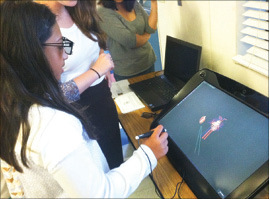 Bullis Charter School is scheduled to introduce a “FabLab,” or Fabrication Laboratory, next year that allows students access to the newest trends in technology. The lab, which will be located on the charter school’s portion of the Blach Intermediate School campus, will be outfitted with easy-to-use, age-appropriate tools that promote scientific modeling and simulations and equipment for robotics, sensing and digital fabrication. Innovation through technology has been the cornerstone of the charter school’s mission since its inception more than nine years ago, according to Superintendent/Principal Wanny Hersey. David Malpica, who led Stanford University’s Transformative Learning Technologies Lab and served as resident expert in 3-D graphics and 3-D printing for education, will oversee the program. Malpica earned a master’s degree in education with an emphasis on learning, design and technology. He studied under Paulo Blikstein, who in 2009 developed the idea of “FabLabs” in schools as a way to put cutting-edge technology for design and construction in the hands of middle and high school students. Bullis Charter School teachers are currently working alongside Malpica to develop units that integrate the tools in ways that engage students and hone their 21st-century skills via real-world application. “Access to these tools also gives those students who might not normally engage with paper-and-pencil learning a unique opportunity to re-engage in the learning process,” said Rebecca Young, fifth-grade teacher at Bullis Charter School. The charter school strives to incorporate innovative technologies into its curriculum, including project-based learning and design thinking.